and would be happy to learn from others. As I wrote in earlier posts - I'm already addicted to Zentangle! This Alphabet Monotangle challenge was up to the letter P and Joey proposed Pea Nuckle. Phew - for me it was very difficult; I started several times! I hope my result conforms to the monotangle rules and I thank you very much for any feedback. Thank you Joey for this interesting challenge. Welcome! I'm so glad that you have found my challenge and that you gave Pea Knuckle a try! I found it a VERY hard tangle myself, which is why they challenge my tangling skills. We can all learn helpful tips and inspiration from each other! 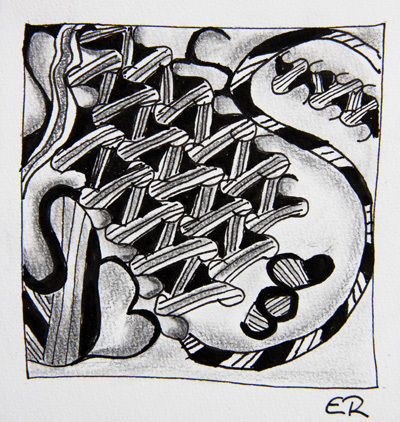 I hope that you will continue to try the previous challenges, we'll be reaching the end of the alphabet monotangles soon and will then move onto other challenging techniques in Zentangle.